Ohmygoodness! I’m so excited! I got an email from Boomama! Now that’s what I call exciting! You have to understand that I have been LURKING for awhile. You know, just checking out the blogging thing! It was my first time to leave a comment on a blog! Are you believing it, first time and I get an email from a woman who appears to be a member of blogland’s royalty! Here’s what happened. . . I was just minding my own business, checking out the Living Proof Ministries website when I noticed a little LPM blog label. Because I am a curious Christian woman--who shares a Beth Moore Bible study history with thousands of other women--I just had to take a look. As I was reading the post, I took a chance and clicked on a link to Boomama that was right there in the middle of Beth and Amanda’s blog. I really didn’t know what I was doing. I knew about the concept of blogging, but had never even thought about participating. Well, when I clicked on that link I fell right smack through the looking glass—sort of like Alice, you know. There was a whole new world on the other side of that click. I had no idea all this was going on! I was, and still am, totally fascinated. When I told my husband and older son about my adventures in blogland, they jokingly asked, “When do you go online?” Of course I assured them that I was just looking and had no intention of getting involved. But after a few days of “just looking”, er, just lurking, I decided to get honest and leave a comment. Uh, oh! “She” answered me—I was hooked! Actually, I wrote the paragraphs above several weeks ago with intentions of starting my blog. But you know how life is--just when you think you have a plan and have the next part of your journey mapped out, a detour or road block appears. I had to take one of life’s detours for a few weeks and have just now returned to the idea of starting my own blog. Husband and son know me well—I can’t resist! OK! So, now, here I am with Cherish…the word! Trying to decide exactly why I thought I had something to say that other people might want to read—and even more importantly, something that hasn’t already been said by someone else with more intelligence, more graciousness, and more humor than I could ever hope to add. Wait a minute—it’s not a matter of doing something better than anyone else—and, really, no one can completely tell another person’s story. It’s not a competition. (I know, I know—there are those cute little award buttons—but I suspect all those people with those buttons would blog anyway.) As I see it, writing—and, therefore, blogging—is all about communicating. Communication requires at least two people. At it’s best, it is about thoughtful consideration of what the other person is saying. It’s about sharing thoughts and ideas. It’s about people of similar—and sometimes different—experiences and beliefs finding common ground. I think blogging adds a big element of fun to the act of communication. For example—the friendly competitions, the memes, the carnivals, etc. I’m telling you, I really did do a bit of lurking and learning—and I can’t wait to learn more. Oh, yes! I think I’m going to enjoy this! Because I’m using the word, “cherish” in the title of this blogspot, I decided to begin by explaining the importance of that word to me. It is a story that I, well, cherish. My precious husband, whom you will be hearing more about in future posts, and I met when he was in seminary and I was a new teacher. This was, of course, back in the day—late 60s day to be exact. We met—as he loves to jokingly tell the story, “at a motel;” as I tell it, “at a church singles function.” Both are true. We met at the Howard Johnson’s restaurant, which happened to be a favorite after-Sunday-night-service hang out for a group of single people from our church. The word keeps cropping up. About a year-and-a-half after we met, we stood in the chapel of our church and repeated vows we had written. We confidently promised to “love, honor, and cherish.” We just thought we knew what those words meant! We have a much better understanding now after babies, teenagers, jobs, illness, successes, disappointments, and never-ending adventure. Cherish—a serious word that can be used to mean to promise to protect and care for, no matter what happens! Fast forward thirty-six years after those vows. I mean, literally, thirty-six years to the day after those vows, that precious man suffered a critical illness that changed our lives. When we knew he would not be able to return to work, he retired from a job he loved in religious publishing. After an extended leave from my job as an elementary school principal, I also retired. In the letter I wrote to my faculty I explained that I had promised to “love, honor and cherish” this man, and my place was at home with him. 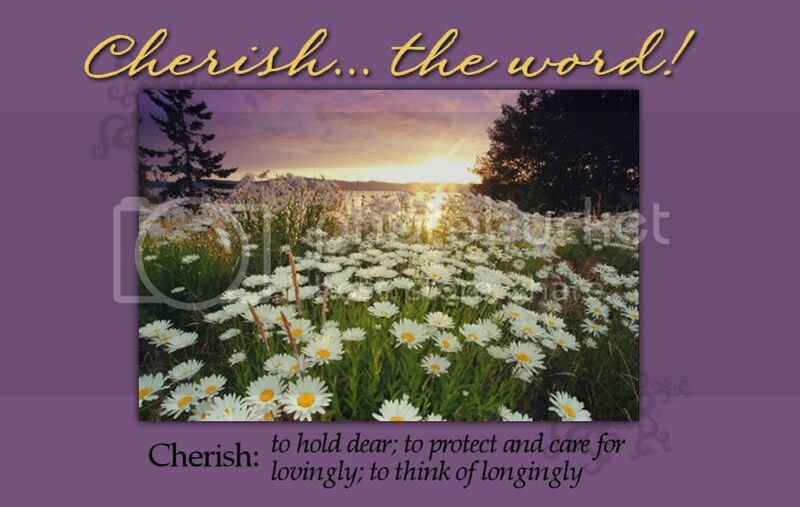 Cherish—a life affirming word that means to love and hold dear forever! Almost two years after Lee spent about three months in the hospital, we continue to thank the Lord for the years we have had as husband and wife and as parents of two wonderful sons. It seems appropriate to me to name this blog in honor of the remarkable life journey we continue to value, treasure, and CHERISH—in all the nuances of its meaning! Therefore, welcome, family, friends--and hopefully some new blogging friends-- to Cherish. . .the word! I will share stories from the somewhat unusual and amazing life journey my husband and I have shared as well as everyday happenings at our home, an occasional grandchild story, and lots of “other stuff” as I think of it. Most importantly, I want to use this blog to praise and honor the Lord and celebrate the patience He has shown me as He has revealed His plan throughout my life. I have a lot to learn about the technical aspect of blogging. I’m not computer illiterate, but there are many tricks of the trade I have not yet mastered (Mr. Linky, etc). I look forward to the challenge. Be patient as I develop this little spot in the blogosphere. Please comment--I would really love to hear from you. Hey There! Have a Great Fourth of July!